It was one of those days when I craved some dirty Chinese. Food, that is. Dirty Chinese food. Greasy chow mein, deep-fried shrimp, chicken cooked in mysterious (and perhaps dubious?) brown sauce. I wanted ALL OF IT. No sharing. Sadly, my date with the Chinese takeout boxes never happened. Instead, I cooked us some kung pao chicken stuffed in baked potatoes. Two comfort foods coming together to form the perfect symphony of flavor. You’re welcome. 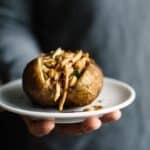 I’m sharing a russet potato and sweet potato version of this recipe because I couldn’t decide which one I enjoyed more! So I’ll leave the decision up to you. Both are just as easy to make and equally delicious. Now let’s take care of those cravings . . .
A Healthier Kung Pao Chicken: This recipe is adapted from my kung pao chicken nachos. I made the sauce even healthier by using less sweetener and less sodium. Hooray healthy Chinese food! Baking Sweet Potatoes: If you decide to make the sweet potato version of this recipe, be sure to line your baking pan or sheet with foil. Sweet potatoes release its sugars when it bakes, which is quite sticky and tends to drip to the bottom of the pan. Save yourself from an extra cleaning session by lining your pans. Cook the Sauce Last: The sauce in this recipe uses potato starch as a thickening agent. When the sauce cools, you’ll notice that it congeals very quickly. Try not to prepare the sauce until the potatoes are nearly done baking. If the sauce congeals before you are ready to add the chicken, add a few tablespoons of water and heat it up again. You can also substitute the potato starch with corn starch. A Note on Cooking Wines: Traditionally, kung pao chicken is prepared with shaoxing wine, which is available in most Asian supermarkets. However, they come in very big bottles, and I don’t blame you if you’re hesitant to buy it. In this recipe, I used sherry wine, which is a good substitute. If you don’t have any cooking wines on hand, feel free to skip that ingredient entirely. The sauce won’t have as much depth in flavor but will still taste great. If you try this recipe, let me know how it goes by leaving a comment or sending me a message! Or take a photo of the food and tag me on Instagram so that I can give you a fist bump! I love seeing your creations! Cook Potatoes: Preheat oven to 425 degrees F (220 degrees C). Line baking pan or sheet with foil, if cooking sweet potatoes. Pierce each potato with a fork several times. Place potatoes on baking pan and bake for 45 to 60 minutes, depending on how big they are. You should be able to cut through the potatoes easily. I used potatoes that were about 7 to 8 ounces (200 to 225 grams), and they cooked in about 45 minutes. Cook Chicken: Place chicken in a medium saucepan. Sprinkle salt on top and add water to cover chicken by about an inch. Bring water to boil. Reduce heat to medium or medium-low, and let chicken simmer for about 10 to 15 minutes. The chicken is ready when it is no longer pink in the middle or when your meat thermometer reads 165 degrees F (75 degrees C) at the thickest part. Let chicken cool on a plate and shred it using two forks or with your hands. Prepare Sauce: Mix 1/2 cup water, tamari sauce, agave, and sherry together. In another bowl, stir potato starch with 2 tablespoons water. Heat oil in a sauté pan over medium-high heat. Add garlic and ginger and cook for a minute. Add red pepper flakes and tamari sauce mixture and let it cook for 1 to 2 minutes. The sauce should bubble vigorously. Give potato starch mixture a quick stir and add to the pan. The sauce should start clumping up. Stir sauce for another minute. Add chicken and peanuts to pan and coat sauce over them. Turn off heat. 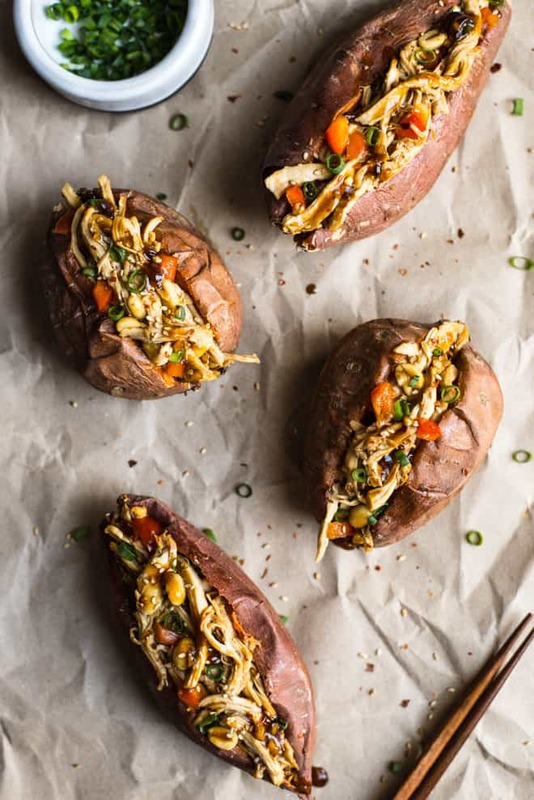 Cut open each potato in half and fill it with the kung pao chicken. Top with sliced green onions and sesame seeds, if you like. looks delicious… and gosh, i love your photos!! Thank you so much, Gretchen! Happy new year to you! What a unique idea! I have never seen anything quite like this before but now I’m definitely curious to try it out! 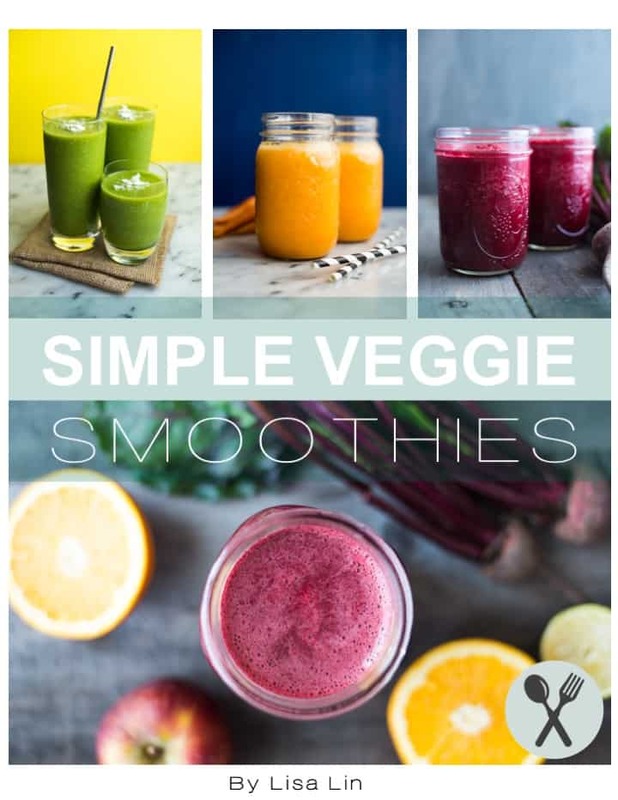 What a great way to blend two of our families favorite foods! Yum!! Wow! What a fun way to eat Kung Pao Chicken! This would be great for a Game Day! Yes, especially with smaller potatoes! I loooove baked potatoes… it takes me back to my childhood of a little café that my sister adored. 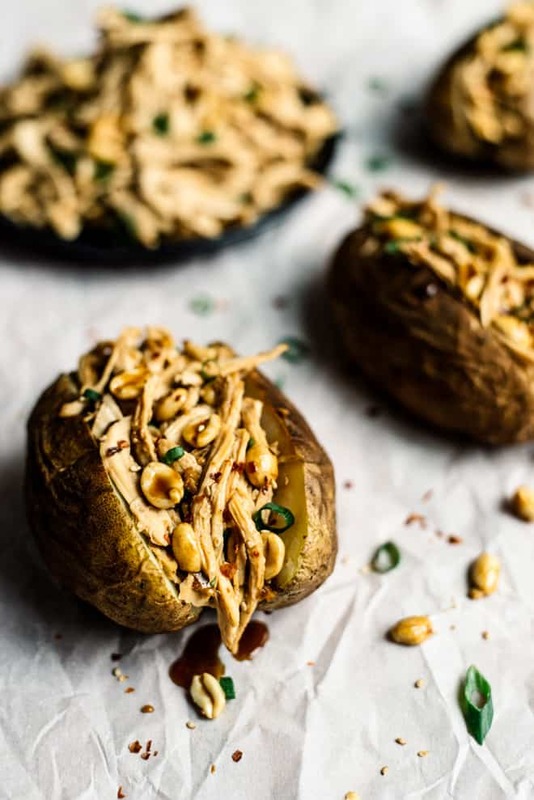 This… now this is taking the baked potato to a whole new level… and I love it!! Thank you, Kirsten, and it’s so sweet that my recipe reminded you of your childhood memories! This is a truly brilliant recipe! Yum X1000! I was just craving stuffed potatoes earlier today!! I want to try the sweet potato version! This is an awesome mash up Lisa. Thanks, Karen!! I made the russet version first, and then thought, “I bet sweet potatoes would be good, too.” It was! Yuuuuuuhs, I’ve been craving dirty Chinese lately, too! I should do as you did and resist the temptation for takeout and make all the clean Chineses in-house. I’m LOVING the Kung Pao + the Kung Pao wrapped nicely in a baked potato. I’m thinking I’ll start with the sweet potato version. Bravo, m’dear! You, me, whenever we get together again, we need to go and have some dirty Chinese food! And thanks for your kind words, my friend! My best friend just went gluten-free and would love this!! Such a creative idea!! Lisa, what an ingenious idea this is! Dirty comfort food is the best kind of comfort food. 🙂 And thanks for the tip with the sherry wine. 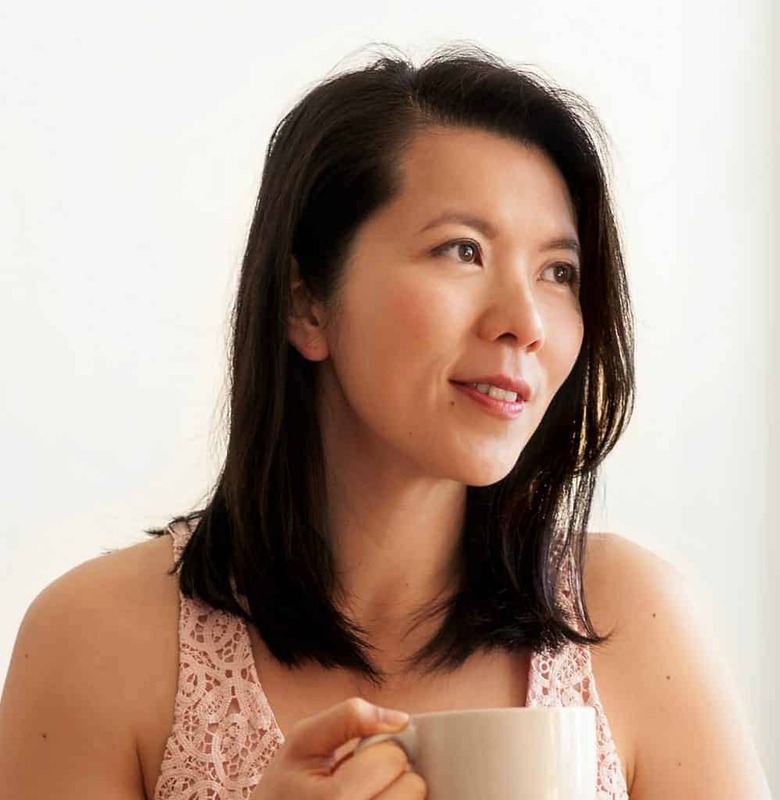 I love Chinese food and since I have Celiac Disease, my only choice is to make it at home. It never occurred to me to put the chicken on a potato instead of rice. This looks delicious! Thank you so much, Amanda! I hope you enjoy this! Iwhat a delicious potato recipe. I love stuffed potatoes and this is a very welcome variant to my traditional recipes! 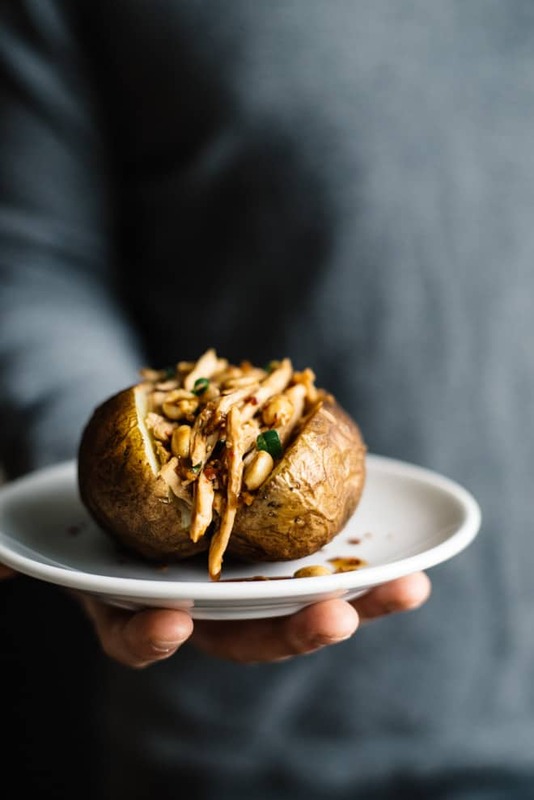 I love kung pao chicken – never had it in a stuffed potato before. DEFINITELY worth a try! Gonna put this on my planner. Thank you for your recipe! Pinning this recipe to my potato love board! What a great idea, the marriage of 2 of my favorite foods! Thanks for sharing this recipe!